Last week I had received some great news from our friends over at ATTO Technology that their ESXi Thunderbolt to Fibre Channel Driver has passed the VMware Certification process and is now officially listed on VMware's HCL. I had known the team was planning to certify their driver but was not aware of their timelines and whether it would actually get accepted given the fact that this was for a Thunderbolt-based device, which is the first of its kind for the VMware HCL. Funny enough, it was roughly around this time last year that ATTO released a Beta of their ESXi Thunderbolt to Fibre Channel Driver which I had shared with my readers here. I was not surprised by the demand given the fact that no official solutions exists for customers who would like to take advantage of their existing SAN-based storage infrastructure when virtualizing Apple macOS (iOS development, etc) on vSphere. ATTO has certified two of their ThunderLink devices, customers have the option of using either the TLFC2082 which provides 20Gb/s Thunderbolt 2 (2-port) to 8Gb/s FC (2-Port) Device or the TLFC2182 which provides 20Gb/s Thunderbolt 2 (2-port) to 16Gb/s FC (2-Port) Device which is supported from ESXi 5.5u3 all the way up to latest 6.5u1 release. Click here for the direct link to VMware HCL. Huge congrats to the ATTO team for getting this on the VMware HCL and partnering up with VMware to provide a solution for our customers who virtualize Apple macOS using vSphere! Lastly, if you are going to be at VMworld and you are interested in learning more about this solution, be sure to drop by the ATTO booth. I can still remember when I was a VI Admin and how annoying it was to try to correlate the build numbers for my ESX(i) hosts and vCenter Servers that I have deployed with the versions listed on VMware's website. This especially gets challenging when there are multiple patch releases (a, b, c or 01, 02, 03) in between major releases (5.5, 6.0, 6.0u1, 6.0u2, 6.5, etc.). Historically, most customers including myself would retrieve the respective build numbers and then manually comparing them to either the release notes and/or download website which was very tedious. For the vCenter Server version output, you will notice that I am also including the OS platform of your vCenter Server, so you can distinguish between a Windows vCenter Server and a vCenter Server Appliance (VCSA) which can be useful to see if you have been #migrate2vcsa ;). For the ESXi version output, you will notice the "OriginalInstallDate" value, this is actually new API property that was introduced in vSphere 6.5 and it provides you with the original installation date of your ESXi host (more details can be found here) which is pretty neat. If you wanted to take this a step further, you could even take this output and dynamically update the vSphere UI using either Custom Attributes or vSphere Tags so you know what version the software is at any given moment. Its easy enough to set this up as a scheduled task that could run periodically so you always have the latest information provided in the vSphere UIs. Although this is a significant improvement over the existing manual methods, I think most of you will agree that it would be ideal if this information was natively available within the product which means BOTH UI and APIs. I think we all appreciate versioning of software is not always easy and it can change from release to release for a variety of reasons, most of which may not be technical. If the vSphere platform could dynamically pull this information in either real time and/or through an offline mechanism and provide this association by default, it would greatly improve the experience when needing to troubleshoot or perform maintenance of the vSphere platform. If this is something you would like to see, please leave a comment below providing your feedback. I know I have already pinged our PMs about this and I am sure they would love to hear form you as well! Note1: Update levels can be found using the vSphere API, take a look at this article here for more details. Note3: As of vSAN 6.2, the vSAN Management API already includes vSAN version information that can be queried. Take a look at this script here which exercises this new API. For example above, I decided to not use this new API since customers may be running older releases of vSAN which is not covered by the vSAN Mgmt API. Note4: VMware has also published simliar build to version mapping for other VMware products which can find the complete list here. The ESXi MAC Learn dvFilter Fling was released a little over two years ago and it has become a must have when it comes to running our ESXi Hypervisor within a VM, also referred to as Nested ESXi. The reason this Fling has become such a popular hit amongst our customers and partners is that it greatly improves the performance when “Promiscuous Mode” is enabled on a Virtual or Distributed Virtual Portgroup, which is a requirement for using Nested ESXi. Although this Fling works great, there are a couple of limitations with this solution today. The first of which is called out in the original Fling release notes, that once a MAC Address has been learned, it never ages out which is not ideal for long running Nested ESXi environments that generates a large amount of new MAC Addresses. The second, is the lack of vMotion support where the learned MAC Address table is not transfered to the destination ESXi host and must be re-learned. To help address both of these limitations, the folks over in the Network and Security Business Unit (NSBU) have been working hard to improve upon the existing solution and have developed a new native MAC Learning VMkernel module called the Learnswitch. This new Learnswitch not only helps improves Nested ESXi workloads but it can also potentially benefit other workloads such as Nested Containers or other 3rd Party network inspection software. One immediate difference from the previous MAC Learn dvFilter solution is that rather than operating on the Network IO Chain, the filtering is now performed within the outer virtual switch layer itself which will provide some additional performance gains. The other added benefit from an internal VMware standpoint is that the Learnswitch is now vmkapi compatible, which means we will have a better backwards compatible story for supporting old releases of ESXi. One downside to this new solution compared to the previous one is that because the dvFilter operated below the virtual switch layer, it could support both a Virtual Standard Switch as well as the Distributed Virtual Switch. With the new Learnswitch, a Distributed Virtual Switch will be required. If you currently do not meet the requirements of the new Learnswitch, you can continue using the dvFilter, but it is recommended that you do not mix both on a single system but you can definitely make use of both solutions across different ESXi hosts depending on the constraints of your environment. It is not uncommon, especially in troubleshooting scenarios where you might find yourself needing to transfer files to or from an ESXi host using a USB device as it may not be reachable on the network. Another common case for directly attaching a USB device to an ESXi host is to transfer a large amount of Virtual Machines that were exported from another system and rather than streaming the content from your desktop, you may want to connect it directly to ESXi host. In fact, I had this very use case when I was a customer after we had acquired a company and needed to transfer their assets to our infrastructure. The IT admins just copied everything onto a USB device and then shipped us the drive for processing. Historically, it was understood that ESXi could only access a USB device (requires disabling the USB arbitrator service) if it contains a FAT16 partition which are then automatically mounted under the /vmfs/volumes/ path. The biggest issue with FAT16 is that the size of the partition has to be <=2GB which severely limits its use for larger files. Another alternative that came up in recent years years is that you could run VMFS on a USB device, but that obviously would require you to format the USB device with VMFS and it would only be readable between ESXi hosts. If you were looking for something more generic like FAT32 which supports a larger partition size, it was assumed this was not possible, at least I was under that impression. It was only recently as part of a project I had been working on where I was re-visiting this topic that I had discovered that other partition types such as FAT32 and even NTFS from a USB device could actually be accessed by ESXi 6.x. The assumption that I and probably others had made was that just because the partitions were not visible or mounted by ESXi, it does not mean the underlying USB device would also not be accessible. To access a FAT32 partition from a USB device in ESXi, you can use the mcopy utility from the ESXi Shell and for accessing an NTFS partition from a USB device in ESXi, you can use ntfscat utility. It actually took me some trial/error to get the correct syntax, but you can see how to use the utilities below. Quick Tip – How to retrieve the ESXi Update Level using the vSphere API? 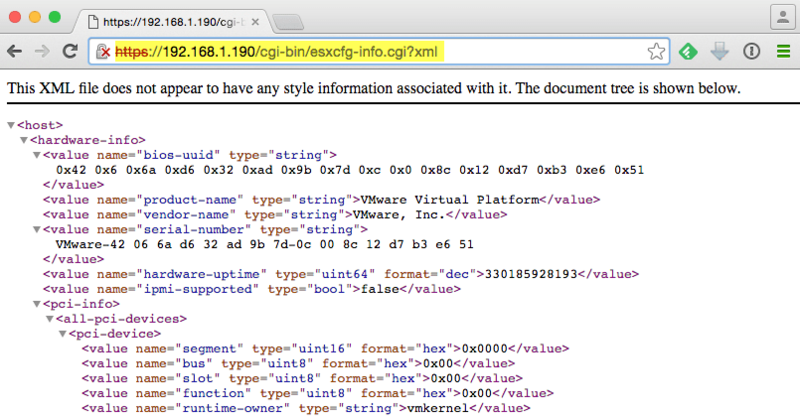 Using the vSphere API, it is very easy to extract the version and build of all your ESXi hosts. This information is exposed in the Product property of an ESXi host. For example, Product.Version will return something like 6.0.0 and Product.Build will return something like 3029758. However, one thing that is not available in this property is the Update Level information for an ESXi host such as Update 1 or Update 2. Historically, customers would have to rely on ESXCLI to pull the Update level information using the following command: esxcli system version get and though this can be run remotely or integrated into PowerCLI as shown in the example below, it would be ideal if this information was just available using the vSphere API. 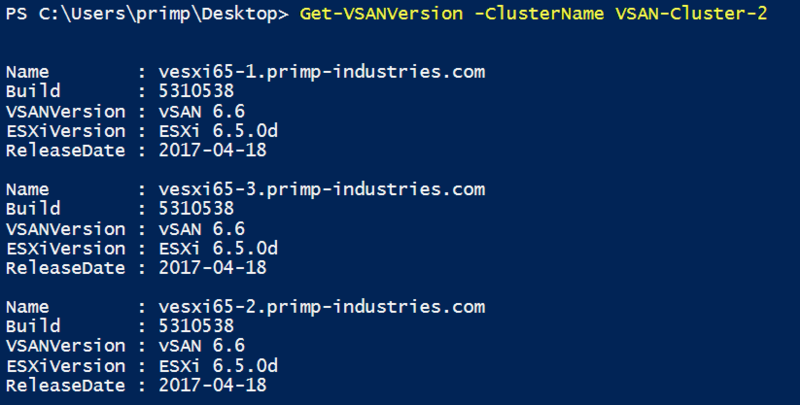 $vmhost = Get-VMHost -Name nuc.primp-industries.com $esxi_version = $vmhost.ExtensionData.Config.Product.Version $esxi_build = $vmhost.ExtensionData.Config.Product.Build $esxi_update_level = (Get-AdvancedSetting -Entity $vmhost -Name Misc.HostAgentUpdateLevel).value Write-Host "$vmhost" Write-Host "`tVersion: $esxi_version" Write-Host "`tUpdate: $esxi_update_level" Write-Host "`tBuild: $esxi_build"
Here is a screenshot of the output for my ESXi host which is running latest vSphere 6.0 Update 2 (including the recent patch release). Using the same technique as I have described here, you can now also use the vSphere API to connect to vCenter Server to remotely collect esxcfg-info from ESXi hosts without having to SSH'ing to each and every single host. Historically, the esxcfg-* commands were only available in the classic ESX Service Console (COS) and the ESXi Shell. 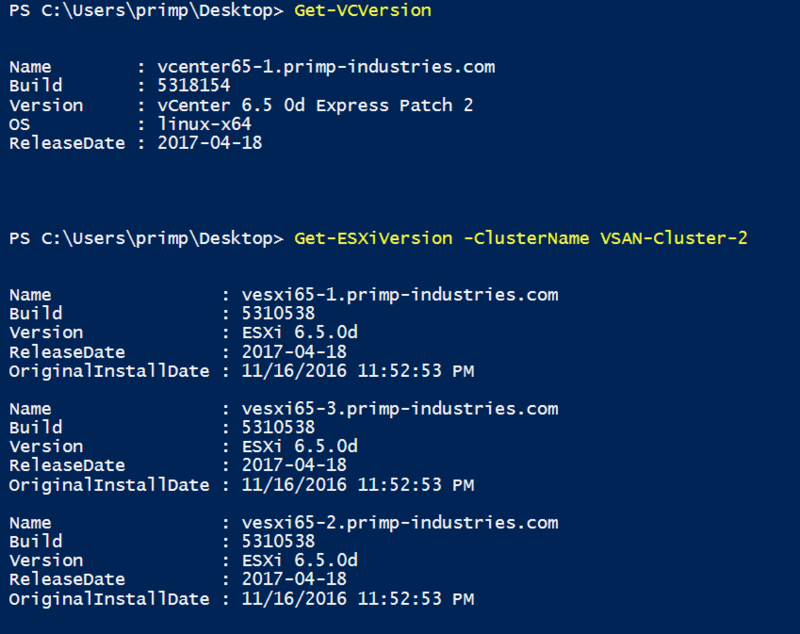 As part of the ESXi transition, VMware has converted all the commands over to the vSphere API which means that you no longer needed to run those local CLIs commands to manage or configure your ESXi hosts like you used to with classic ESX. 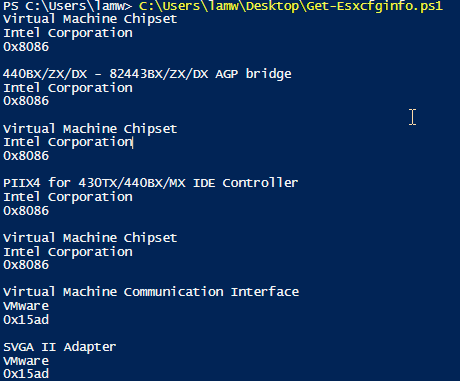 Once you have authenticated with a valid user, you will see that the output matches the output if you were to manually run esxcfg-info command on the ESXi Shell. With the second formatted option, we can now easily retrieve the result and store that into an XML object for processing using any one of our favorite scripting/programming languages. In the previous article, I demonstrated the use of the vSphere API method AcquireGenericServiceTicket() using a pyvmomi (vSphere SDK for Python) script. In this example, I will demonstrate the exact same use of the vSphere API but now leveraging PowerCLI. I have created a script called Get-Esxcfginfo.ps1 which connects to a vCenter Server and requests a session ticket to a specific ESXi host's esxcfg-info.cgi URL and that will then return us a one time HTTP request to connect to the ESXi host to retrieve the requested information. I have also included an example of how to parse the XML return in the script itself. As you can see from the screenshot below, I am extracting the Device Name, Vendor Name & Vendor ID from the esxcfg-info output. Pretty cool huh? Stay tuned for one more blog post which I will show you another way in which you can make use of this vSphere API!